I got my order from the Lush NA Party yesterday! Click here to read details about the party! The temptation of Snowcake solid perfume was strong so I did in fact order it and some other goodies. 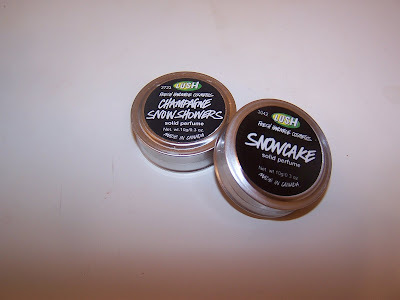 I normally avoid ordering from Lush NA like the plague but I couldn’t resist Snowcake! I stupidly ordered this solid perfume without first trying the lot I had already purchased from Lush UK that I got about a month ago. I finally got around to testing these out and I have to say they aren’t as great as I had hoped. Lush Perfumes have fantastic throw, linger, and staying power however Lush solid perfumes do not. I used Potion so far and Fever and both are very strong smelling but they don’t do much when they are on my skin. I think these are great if you happen to already own some of the perfumes in liquid form. That way you can use these as touch ups through out the day however to use these as your perfume is a bit difficult as someone has to literally stick their nose in your neck to actually get a whiff some of what you are wearing. If you’re purchasing these from Lush NA they come in a far better tin than the Lush UK solids. Lush UK has little screw tops that I find very annoying to unscrew. If you by chance you drop the tin or get a dent in the container it’ll basically leave you struggling to unscrew the top. Lush NA tops just pop off and on and make life much easier however they do leave a bit of a mess sometimes as when you’re popping on and off it sometimes gets a bit of the solid on the lid which causes the tin to have a waxy feel. Speaking of waxy. That’s basically the texture of these. They are a waxy balm that’s difficult to spread around so it’s best to warm it between your fingertips prior to applying. I can’t give these a complete bad review because these actually work for one of my best mates. It seems they really like his body chemistry because when he used one it was pretty strong but when I used one it basically got soaked up into my skin and I really had to try and even get a tiny sniff of the scent I was wearing. I love these for touch-ups when I’m using my Lush perfumes but to use on their own it’s a no go for me! I got a 7 of the 9 scents offered and I find the strongest smelling of the lot are Fever, Potion, and Honey I Washed the Kids. Champagne Snow Showers, Snowcake, Silky Underwear, and American Cream are the lightest with the least throw! I will say you have to layer these on quite a bit. Take some and place it behind your ears, between your breasts, on your neck, behind your knees, and on all your pulse points. So yes with a little hard work you can have yourself smelling sweet somewhat plus if you happen to heat up during the day you’ll definately see more of a throw from these! However, I still can’t give them a raving review because I just don’t think the throw is good enough to get that excited about, believe you me it’s difficult not to run around and recommend Lush as I adore and love all things Lush but these failed me somehow. The moral of the story is at $11.95 a tin I’d say skip ’em and buy something else! Or if your body chemistry just happens to accept and like them…lucky you…grab tons! But test, test, test, test in store and don’t be a silly sausage like the Muse and just buy without first testing! *sigh* It pains me to say it, but I am NOT 100% pleased with my Silky Underwear solid. Though I imagine it’s the softest, lightest scent of all offered. I never snagged a spray version, so. Luckily, it was free with my SCENTME01 code (free solid with any purchase over $65 that includes a wrapped gift…the huge LUSH Pud counts!). It smells like cat pee…er, vetiver…so strongly in the tin that I figured it’d reek on my skin. Nah. It doesn’t have a terrible amount of staying power to reek. Those close enough to me to touch me or you know, not stand a polite distance away, can smell it. I do have really warm skin (I register with a slight fever all the time, though I do not have one). I *think* that helps the throw. Now, I gotta say that the Snowcake solid….daaaaayumn. That smelled like Jergens and cherries in the tin which made me quite nervous. But no no, it’s got throw and strength and it just fine for me. 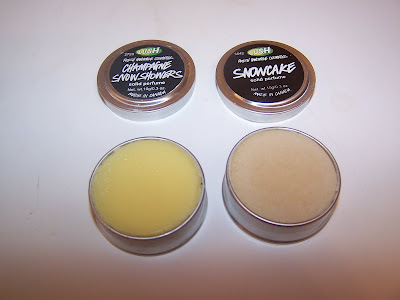 It might help that I have a bottle of Snowcake headed my way, but I’m pleased enough with the solid to try some of the stronger scents–I hear HIWTK and Go Green are decently-strong. I loathe American Cream’s perfume spray; it smells off to me. I don’t get the lovely creaminess that other products in the scent offer. I might go in for the solid, in that case. Just waiting for a mad sale on or after Christmas. I heard some versions of SU had a weird smell to it. a la cat pee sadly! But mine was pretty ok and strong for me! However these are just for touch ups or intimate encounters because they seriously lack any throw at all! It takes some damn hard work to get these to smell! Maybe if we melt them down in the microwave and pour them over our head but sadly I can’t think of any other way for these to linger! LOL it does smell like Jergens but once on it’s definately it’s own unique scent! God I could eat this stuff it’s so amazing! Are you new to Lush or a oldie? I have snowcake perfume from the UK rounds and I’m hoping, for the love of god, that the NA version is just as lovely. I stashed away about 2 million bottles but I was tempted to order one from NA to see how it compared! Go Green is probably not me 😛 HIWTK was ok! AC is weird on but it kinda dries down nicely! There is definately a sale after xmas 😉 WAHOO! and if you got the giant lush pud you got your 15% coupon too! w00t! Yeah, some SUs seem to be the “gardenia version” and others the “vetiver version.” Hmm! I know…ah, well, at least they’re fun to smell. I like to smell myself of course, kind of an obsession with scent! Huffing my own wrists! I did hear the UK ones weren’t *better* which surprised me, to be honest! Usually LUSH UK items are brighter and just fresher and stronger. Hmm…sorry they didn’t work out. At least you have your own private sniffing pleasure. Ew. That sounds awful. Hehe. I have been in love with LUSH since I found my skincare routine ;). 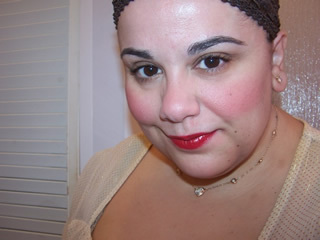 I think I first got some goodies in mid-2006, but never felt like a Lushie until I found items that made my skin GLOW! As for the NA version, I hope it’s nothing like this year’s Snow on Snow. Ugh! I normally hate green scents (ew at Karma line! ), but I really like the newer ‘Go Green’ line, like Greenwash. I’m surprised! I’m more into soft florals or sweet scents. I’ll probably snag an AC/HIWTK if the after-Christmas LUSH NA promo is good (horror of horrors, I do not live near a store!) …if not, I’ll wait and place a UK order. I am loving my giant Pud, but can’t break him up :(. I am sure I will once I go through the remainder of my ordinary Puds ;). Thanks for replying! I love talking with fellow Lushies! You’re a doll ;). Guess it all depends on which one works with my body chemistry because I sure get a weird down on some of these! I was very surprised too as I only order from Lush UK a majority of the time and to find these weren’t so hot was disappointing to say the least! I have about 10 cans of snow on snow from last year so I didn’t get a chance to sniff this year’s disaster! But I heard the tales and was sorry to hear as they did a fab job with Snow on Snow last round! I didn’t dig greenwash that much to be honest because I’m not so into Karma or green earthy stuff but I am curious about the Green Body Spray Hmmm..
You aren’t missing much store wise. I always find them a disaster area to be honest and prefer just slapping down $40 for airmail and having it shipped fresh to my door minus people feeling up my bath bombs and face care in store! Gross! I slapped my Giant Lush Pud as soon as I get it. No mercy! hehehe! Awww you’re a sweetie too! And I adore speaking to Lushies too as I have only a few new folk to Lush here on blog 😉 I’ve converted them all hehe!